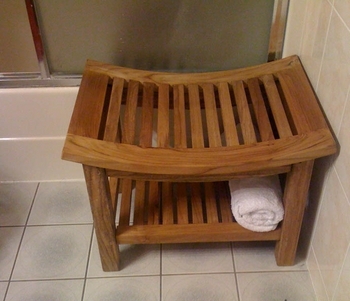 the teak shower bench made with sustainably grown plantation Agrade teak wood. this shower bench is perfect for shower, bath, spa, sauna or also bedroom seating, guest room, garden, patio, balcony, terrace & deck use. The Curved Seat solid teak Shower Bench, always ready, substantial, with side arms and perfect for sitting while showering, shaving legs or washing your feet.